Birds have always been considered as intermediaries between the heavenly and the terrestrial world. People at all times believed that the birds convey the will of the dead, so they always brought sad news and were considered omens of misfortune. But is it really? Find out the meaning of signs if the bird flew into your window. In Russia, knocking birds out of the window was considered a bad omen. With a knock the bird warned of impending disaster or loss. Our ancestors said that the bird is the soul of a deceased relative, who came to take along one of his relatives. But in fact, not all birds bring grief. People still in ancient times noticed that the greatest misfortune brings the crow and the cuckoo, they are harbingers of poverty and all sorts of misfortunes. But if a swallow knocked on the window, an unexpected joy awaits you. Most likely, prosperity and well-being await your home. She notifies of a speedy recovery and promises financial well-being. The bird in all the fairy tales is called the Blue Bird, which brings joy. So in the signs if the little bird knocked on your house, happiness awaits you. It foreshadows the birth of children and the fulfillment of desires. A dove on your window says that you should wait for news from far away, but remember that the news can be both sad and joyful. A broken bird is a bad omen. You should be more attentive to your health and your loved ones. Remember, this is a foreshadowing of trouble. If the bird flew into the room, you should not be afraid, it means that good and unexpected news is waiting for you soon. Little birds will bring big, but still positive changes. If a pigeon has flown into the house, wait for the letter, with good news from relatives. 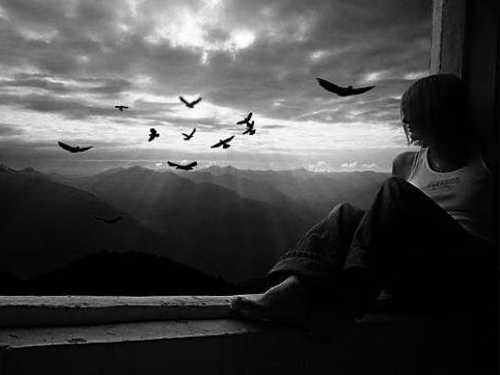 If the birds do not promise you anything good, grief can be avoided, as our ancestors did. It is necessary to collect all the bread that is at home and distribute it to the poor, it will bring trouble. You also need to feed the birds outside the window, so appease the messengers of misfortune. After the bird has broken on your window, you need to wash it thoroughly, and then go to church. Sincerely ask for forgiveness for the sins of your family and put a candle for the rest of the dead relatives. A good talisman in such cases is a bunch of rowan, which should be hung outside the window. Also for help you can turn to the house, having treated him with milk or honey. The guardian of the house will help ward off future troubles. You need to ask for three days in a row.